The last time sales volumes fell this much on an annual basis was 16 months ago. For New Zealand excluding Auckland, the number of properties sold fell by 6.6% when compared to the same time last year (from 4,922 to 4,596). In Auckland, the number of properties sold in February fell by 17.9% year-on-year (from 1,654 to 1,358) – the lowest for a non-January month since October 2010. Otago: -14.9% (from 422 to 359 – 63 fewer houses) – the lowest for 11 months. Hawke’s Bay: +0.4% (from 231 to 232 – an additional house). Bindi Norwell, Chief Executive at REINZ says: “At a time when sales volumes are normally strong, when we look across the country, 13 out of 16 regions actually saw an annual fall in the number of properties sold. Traditionally children go back to school and people return from their holidays and housing activity picks up, however, February 2019 has been an exception to this rule. “The lower level of sales volumes compared to the same time last year can be attributed to a number of things – the raft of legislative changes impacting the housing market at the moment, the increasing difficulty in accessing finance (despite a record low OCR and very low mortgage rates from the banks) and vendors’ pricing expectations. “What we’re hearing from salespeople around the country is that vendors and investors are taking a ‘wait and see’ approach to the housing market – much like you would normally see around election time. This is particularly true in relation to the recently announced Capital Gains Tax proposals from the Tax Working Group. Families want to know what aspects of the proposals the Government will look at accept ahead of next year’s election and what impact that will have on them and their family,” continues Norwell. Median house prices across New Zealand increased by 5.7% in February to $560,000, up from $530,000 in February 2018. 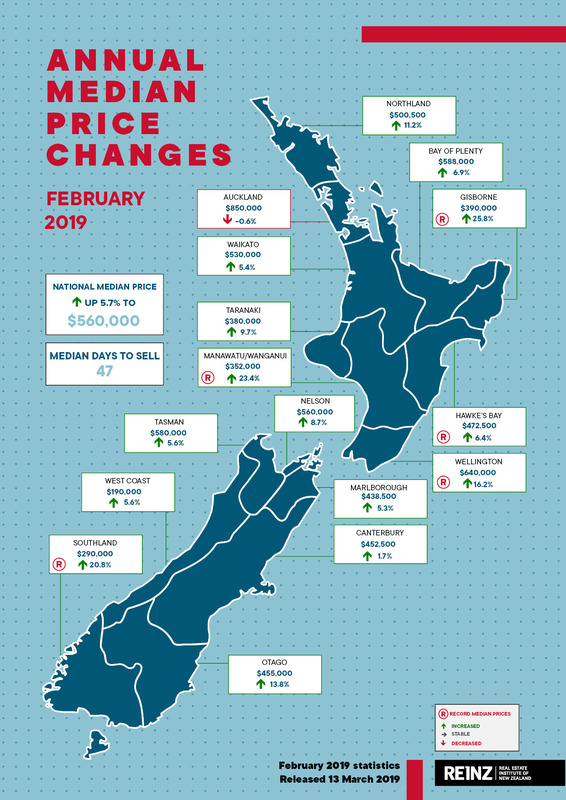 Median prices for New Zealand excluding Auckland were even stronger increasing to a record $490,000 up 8.9% from $450,000 in February last year. Median house prices in Auckland returned to the $850,000 mark – down 0.6% on last year’s figure of $855,000, but up 5.6% on January’s median price of $805,000. Hawke’s Bay: +6.4% to $472,500 (up from $444,000 at the same time last year). “February saw 15 out of 16 regions experience an annual increase in the median price, with 5 regions seeing record median house prices highlighting the strength of the housing market around much of the country. With house prices continuing to rise at such a pace, this puts even more of a dampener on any notions of New Zealand following in Australia’s footsteps in the short to medium term. Even Auckland saw an increase from January, showing it has returned to the same, stable or flat market we’ve been seeing since April 2017,” points out Norwell. “Auckland’s median price fall was the result of a slight fall in the number of million dollar plus properties sold which fell from 36.9% in February 2018 to 36.1% this February. Despite the annual fall in median price, there were some areas of the Super City that saw some growth including Auckland City where prices increased 3.9% to $1,000,000 – the highest price for Auckland City for 20 months. Additionally, Papakura District saw an annual increase of 3.8% to $649,000 and Franklin District saw an annual increase of 2.3% to $670,000. However, Rodney District and North Shore City saw annual median house price falls of 0.8% and 0.2% respectively,” continues Norwell. 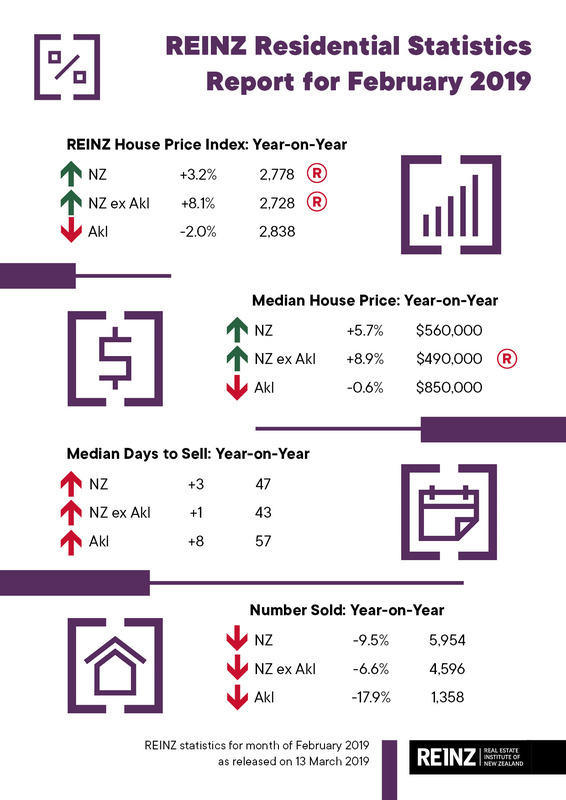 The REINZ House Price Index for New Zealand, which measures the changing value of property in the market, increased 3.2% year-on-year to a new record high of 2,778. The HPI for New Zealand excluding Auckland increased 8.1% from February 2018 to a new record high of 2,728. The Auckland HPI decreased -2.0% year-on-year to 2,838. The REINZ HPI saw 8 out of 12 regions experience a record high level over the past 12 months, highlighting the overall continued strength of the property market. The exceptions were Northland, Auckland, Otago and Southland. In February the Manawatu/Wanganui region again had the highest annual growth rate, a 19.4% increase to a new record high of 2,984, followed by Gisborne/Hawke’s Bay in second place with an annual growth rate of 13.8% to a new record high of 2,762 and in third place was Southland with a 12.6% annual increase to 2,797 – down -1.8% from its peak in January 2019. In February the median number of days to sell a property increased by 3 days from 44 to 47 when compared to February last year. For New Zealand excluding Auckland, the median days to sell increased by 1 day to 43. However, Auckland saw the median number of days to sell a property increase by 8 days from 49 to 57 – the highest number of days to sell since February 2009. Manawatu/Wanganui had the lowest days to sell of all regions at 30 days, down 10 days from 40 at the same time last year. 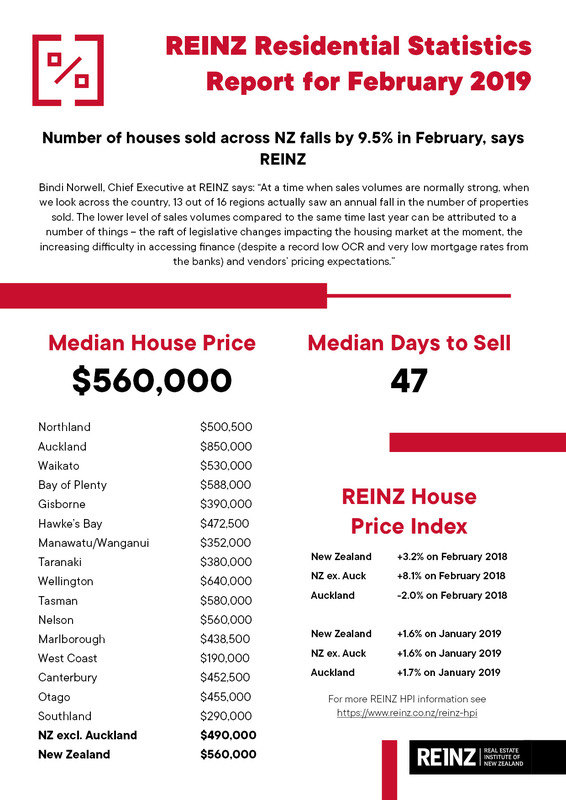 The West Coast always has the highest days to sell of any region (at 91 days in February 2019), but the median number of days to sell in Northland has reached a high of 61 days – the highest in since August 2015. “With vendors holding out to achieve their price expectations, it’s little surprise that the median number of days to sell has slowly been increasing over the last few months. What was interesting though is that this is the first non-January month since February 2017 that no region had median number of days to sell in the 20s,” says Norwell. Auctions were used in 11.1% of all sales across the country in February, with 663 properties selling under the hammer – this is down slightly from the same time last year, when 11.8% of properties (776) were sold via auction. Gisborne again had the highest percentage of sales by auction across the country with 56.4% (or 31 properties) in the region sold under the hammer – up from 46.0% (29 properties) in February 2018. Auckland saw the second largest percentage of sales by auction on 21.5% (292 properties) down from 22.0% in February 2018 (364 properties). Bay of Plenty remained in its usual third place in February with 13.2% (59 properties) sold under the hammer, down from 16.7% (77 properties) in February 2018. The number of properties available for sale nationally decreased by -0.3% from 26,943 to 26,850 – a decrease of 93 properties compared to 12 months ago. Marlborough: +5.7% from 349 to 369 – an additional 20 properties. Wellington once again saw the lowest levels of inventory with only 8 weeks of inventory available to prospective purchasers. This was closely followed by Otago and Hawke’s Bay on only 9 weeks’ inventory, followed by Gisborne on 10 weeks’ inventory available. “This is the fourth consecutive month that we have seen an annual decrease in inventory levels. This will continue to be a concern for the industry, and we expect that the ongoing pressure on inventory will result in price increases in these regions, potentially pushing people to more affordable areas in other regions,” concludes Norwell. The number of homes sold for less than $500,000 across New Zealand fell from 45.8% of the market (3,012 properties) in February 2018 to 41.5% of the market (2,473 properties) in February 2019. The number of properties sold in the $500,000 to $750,000 bracket increased from 27.7% in February 2018 (1,821 properties) to 30.7% in February 2019 (1,825 properties). At the top end of the market, properties sold for $1 million or more decreased from 13.1% in February 2018 (859 houses) to 12.5% in February 2019 (746 houses). During February, new listings fell 6.5% when compared to the same time last year – from 11,269 to 10,535. The only regions to experience an uplift in new listings were Central Otago/Lakes (+11.8%). West Coast (+7.6%) and Wellington (+6.9%).